(People's Daily) Minimum wage is an issue for people to decide: Hong Kong chief. October 13, 2006. In Hong Kong, the arguments on minimum wage between the labor and the employers have lasted for many years but without consensus. The labor has always pressed ahead to legislate on minimum wage among the security and cleaners sectors in particular as soon as possible. But employers said in order to compete in a globalized economy, it is a remaining advantage for Hong Kong not to force employers to accept the deal via legislation. "If this matter were pushed through the Legislative Council at the moment," Tsang said, "it would be a very, very bloody fight... there would be serious arguments over this, the community would be torn apart." In his policy address, Tsang proposed to launch a Wage Protection Movement for workers in the security and cleaning sectors. He promised to legislate on the minimum-wages issues two years later if the movement fails and employers are not paying market rates. What is so special about cleaners and security guards? The following explains just what a cleaner does on a daily basis under the prevailing wage system. At a minimum, it should be clear that a legislative mandate on a minimum wage is useless without vigilant enforcement. You may mandate a HK$30/hour wage, but the outsourcing companies can come up with all sorts of excuses to subtract from that amount (for example, as "adminsitrative fees" and "extra income"). (Next Weekly) Three Shifts: A Housing Estate Cleaning Woman. Issue# 869. November 2, 2006. On November 7, the mid-term elections will be held in the United States and the minimum wage will be one of the key economic issues. Last month, Hong Kong SAR Chief Executive Donald Tsang appeared at the Legislative Council and said: "There will be no legislation or evaluation of the minimum wage." Meanwhile at a certain housing estate in Kowloon, thirteen cleaning women work three shifts a day (that means, working three separate shifts individually as opposed to changing shifts with each other). Each morning, they begin work at 7am and they finish at 1130pm at night. Even without including the rest periods in between, they have to work 12 hours a day. 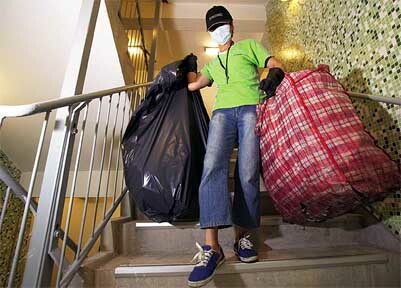 They make HK$6,000 per month (at the private housing buildings) or HK$6,500 (at the public housing buildings), but the outsourcing company points out that the cleaners can earn money by picking up garbage and selling it to re-cyclers. Therefore, each worker has to turn HK$500 back to the company each month. In addition, they have to "sell" the four days of vacation per month back to the company while making the same wage. If they insist on taking the vacation days, they will have to repay the company another HK$500. After all those deductions, they end up making about HK$10 per hour. So McDonald's is generous by comparison. Ah Chun wakes up every day at 6:00. She makes breakfast for her husband and children: instant noodles and steamed buns; if she is running late, she runs downstairs to buy some bread. She just eats something for herself and then she rushes out. At that hour, her family is still asleep. The thirteen female workers have many things in common: they all work in the estate that they live in because the outsourcing company will only hire within the estate and thus make sure that the workers have no excuse to be late. They are all new immigrants. Most of their husbands are construction workers who do not get enough work. Therefore, the wives are the principal income earners of the family, and that means they are easy to bully. The thirteen people are responsible for cleaning ten buildings. Based upon unofficial statistics, this must be tops in Hong Kong. The emphasis of the first shift is garbage removal and cleaning the two garbage cans on each floor. Each building has forty floors, so there are 80 garbage cans. Each building is handled by one individual, but the public estate has more occupants and therefore they need two people. We interviewed Ah Chun on Saturday. She told us to come a little bit later because the residents toss out more garbage on Saturdays. I saw her haul two garbage bags around to patrol the various floors. One garbage bag was for waste paper and the other one for metal cans and plastic bottles. This was just after the Mid-Autumn Festival and there were a few mooncake boxes. Since they can make money by selling the garbage to re-cyclers, the company got jealous and required them to pay HK$500 for the privilege. If a cleaner does not sell HK$500 of recycled products, then that is just tough luck for her. "Big Sisters" (=the supervisor) said: "This is an administrative fee. If you don't like it, you can call the police." Every Monday, Wednesday and Friday, they have to clean out the garbage accumulated on the eaves and this is where they have to perform the aerial trapeze act. Every Tuesday, Thursday and Saturday, they have to clean the elevator lobby and the fans. After a few years of work, the forty-something-year-old Ah Chun looks like she is in her 60's. "I'm going to become a little old lady soon. When I first arrived, I weighed 138 pounds. I now weigh 110 pounds." I joked that this was the most effective slimming method, but her facial expression told me that this was a stupid joke. On each shift, they have to punch in and out. That makes six times across the three shifts. At 11:30am, she completes her first shift. She gets out of her hopelessly filthy uniform and goes to the market to buy food to cook for her unemployed husband. She takes a bath and changes into her second set of uniform. Then she heads back to work again. She has no time to watch over her children. One day, she went home at noon and found her eldest son standing outside the door. The younger brother and sister were having a big fight inside. Another worker Ah King went home and found feces on her son and on the floor. The child had lost control of his bowels and opened the drawers to look for some pants to change into. Actually, mom was the one who was rueful: "His penmanship is terrible. For as long as I have been in Hong Kong, I have never held his hand to guide him to write. When I think about the child, I could cry." Ah Chun and her partner wipe the windows in the lobby of each hall. In a 3-1/2-hour period, they can do eight floors at the most. They will get done with the whole building in five days. Next week, they will be mopping the floors. The week after, they will go back to wiping the windows. This is repeated again and again. "Wiping windows is tough on the fingers," said Ah Chun. "I don't have the strength to hold chopsticks when I eat." "Big Sister" will pick a floor in any building and wipe the window with a paper towel. If there is any dust, she will say, "Do this one over!" Recently, they found out that the company was only making pension contributions of HK$190 per month, which is equivalent to a monthly salary of HK$3,800. At HK$6,000, the company should be making pension contributions of HK$600. "The outsourcing company is cheating us out of our hard-earned money," said Ah Chun. "Sometimes, I wonder why I came to Hong Kong." The second shift is over. Ah Chun goes and shops for more food to make dinner. The children are not back from school yet. Why is her husband just standing around watching? "He is a macho man." Regardless of how busy she is, she insists on making soup at least once a week. "One time, I was just too tired and I fell asleep. The soup boiled until all the water had evaporated. The neighbor had to pound on the door and yell, 'Fire!'" She bathes again. But since the company only issued two sets of uniform per person, she has to go in plainclothes on the third shift in the evening. She takes out the garbage a second time. Ah Chun handles the top floors (floor 20 to floor 40) while her partner handles the lower floors (floor 1 to floor 19), and then they meet up again in the garbage room downstairs. They rarely take time off. In her memory, one worker's 90-something-year-old mother-in-law in the mainland was ill and she asked for a day off -- a day off meant the eight hours in the first two shifts and then she hurried back to work the third shift or else she would have to pay the company HK$70 back. The four hours in the third shift was only worth HK$40 in wages! This is an amount that not even a mathematics professor can figure out, but the outsourcing company came up with it. How about complaining? Big Sister would demand their letter of resignation instead. Ah Chun is worried about her job and she asks the reporter not to name the housing estate or the outsourcing company. Ah King says, "We are in sad shape. When you have no money, you are in sad shape." After getting off the third shift, Ah Chun takes another bath. The children whom she had not seen all day are already asleep. Ah King does not know if her son went to school. The lunch money on the desk is still there ... the teacher calls: "Your son did not go to school." "If I work like this, how will I bring up a good son?"